Based in a beautiful forested area, Delta Force Paintball Cardiff in South Wales provides customers with six thrilling Hollywood style game zones to enjoy, including: A Bridge Too Far featuring three big wooden bridges for groups to secure and the exclusive D-Day Landing paintball game scenario where players have to fight their way up the Normandy beach and take out the German defence! And for those who fancy adding a bit more drama to their games, Delta Force has a number of paintball smoke grenades available. These can be used as a defence technique or as a clever way of confusing the enemy! We have an awesome collection of game scenarios to suit everyone’s tastes here at our Cardiff paintball centre – you won’t be disappointed! More than 20,000 people visit Delta Force Paintball Cardiff every year and the centre is highly regarded as one of the best tourist attractions in Wales. It also helps boost the local economy by employing local staff who are committed to making sure your time with us is as enjoyable as possible. The Cardiff paintball centre was also a recent winner of the UK Paintball Centre of Excellence Award and received a full refit and refurbishment last year. Delta Force also announced a new paintball gun during this time at the centre – the Tippman F-12 which operates on high pressure air, thought to be the next big thing! Delta Force Paintball Cardiff is also a popular venue for special occasions like birthdays and stag and hen parties! Our experienced staff make sure your day with us runs smoothly and we can even provide all inclusive packages for stag and hen events to make organising your day easier. For our younger players (aged 8-10 years old), we provide mini paintball events. 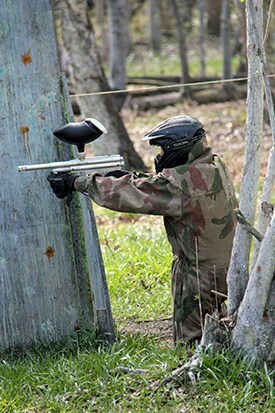 These unique and exciting paintball events ideal for children use smaller, light-weight paintball guns and smaller paintballs; causing less energy to be released when participants are hit and therefore creating a softer impact. 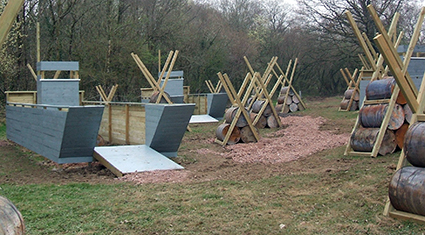 We also have strict health and safety procedures in place and provide all players with high spec paintball safety gear and equipment, including full head protection goggles, combat suits with padded neck collars and top of the range semi-automatic paintball guns that are well looked after and maintained to ensure optimum performance on the battlefield. To book your event at Delta Force Paintball in Cardiff or to request more information about paintball birthday parties or stag and hen events, please call 0203 869 9301 and speak to a member of our booking team.